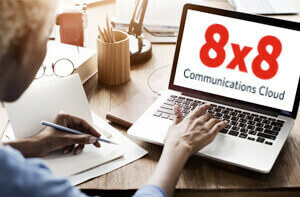 8x8 Hosted VoIP Seamlessly Connects Real Estate Agents Wherever They Work | 8x8, Inc.
Hurricane Sandy hit New Jersey hard, irreparably damaging RE/MAX Tri County’s NEC phone system. Instead of installing another premises-based PBX, the company upgraded to 8x8 hosted VoIP service. Now, with its phone system safely secured off site, the company is ready for anything. When Rosalie Daniels founded RE/MAX Tri County in Hamilton, New Jersey, in 1991, she wasn’t interested in running a traditional real estate company. Her business philosophy is to empower independent agents by letting them spread their wings while operating under the RE/MAX umbrella. Over the years, that success has grown to include 57 agents who handle both residential and commercial real estate, and a large service area that encompasses Mercer, Burlington and Monmouth counties in central New Jersey (hence the name RE/MAX “Tri County”). In keeping with Daniel’s supportive but flexible approach, about 40% of the company’s agents regularly work from home, and the remaining 60% work out of the company’s main office. When Hurricane Sandy struck in 2012, the company’s office was spared direct damage, but recurring brownouts damaged the hard drive of its 14-year-old NEC phone system. Daniels and her office manager, Mary Mammino, had dealt with repairing the phone system once before, when their building was struck by lightning. This time the prognosis was more dire: the hard drive was too old to be repaired and needed to be replaced quickly. 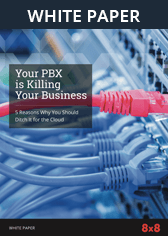 “Our PBX was still working, but we were limping along,” says Mammino. “Because parts of the hard drive were damaged, features like electronic fax and voicemail were not reliable anymore. We knew it was just a matter of time before the whole system went down.” Daniels had started looking into new phone technologies even before Hurricane Sandy, because she knew the NEC system was approaching its end of life. Although she didn’t have a specific vendor in mind, she did have one key criterion. 8x8 gives us state-of-the-art equipment and great support, plus we still have full control over our phone system and our business. Daniels and Mammino had to delay their decision for a few weeks while waiting for the company’s insurance company to settle their claim for the damaged phone system. In the meantime, they attended the annual statewide RE/MAX sales rally—and got a tip from a business partner that pointed them toward 8x8. Daniels and Mammino worked with 8x8 to develop a proposal for a new system that would be installed as soon as RE/MAX Tri County’s insurance claim was settled. Once that happened, the entire installation process took just three days. “Even though our agents didn’t do much training on the new system, the 8x8 interface makes it very easy for them to use the phone features,” adds Daniels. With 8x8 hosted VoIP service, every RE/MAX Tri County agent now has a direct phone line and can take calls anywhere. This means even the company’s many work-at-home agents are now seamlessly connected to the main office. Like many real estate companies, RE/MAX Tri County relies heavily on faxing to transmit signed documents. 8x8’s Internet fax feature has dramatically improved both the timeliness and security of faxed materials for the company. In addition to receiving electronic faxes in their inboxes, RE/MAX Tri County agents see all their email and voicemail messages, too. They can read or listen to messages using their smartphones or computers without having to switch devices. RE/MAX Tri County’s agents are constantly on the move, showing properties in multiple counties. 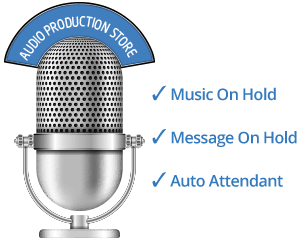 The mobile features included in the company’s 8x8 hosted VoIP service ensure they never miss a sales call. Daniels experienced that freedom first-hand during a recent trip to Mexico. She used the 8x8 mobile app on her smartphone to answer business calls. Daniels and Mammino estimate that about 80% of the company’s agents are now using the 8x8 mobile app on their iPhones or Android phones. The remaining 20% simply log in and forward calls to their cell phones when they’re on the go. “We do a lot of business on our cell phones, and 8x8 makes it easy for agents to take the office with them,” says Daniels. As the office manager, Mammino is responsible for setting up new agents on the company’s phone system. In the past, it was a tiered process that took several days and communications with several different companies. Now with 8x8 hosted VoIP service, the process takes just a few minutes. “To set up new agents, I contact our 8x8 account manager to add the lines we need. He typically gets back to me within a couple of hours, and then I set up the new agent profiles online. It’s very easy and only takes about 30 minutes,” says Mammino. Both Daniels and Mammino agree that there are still many more benefits agents can reap from the company’s 8x8 phone system. The challenge is getting agents to slow down long enough to learn about more advanced features. In the meantime, Daniels and Mammino are confident that 8x8 hosted VoIP will continue to serve the company well—no matter what natural disasters might come their way. Even so, Daniels hopes there isn’t another “storm of the century” in the company’s future. “But if there is another one, hopefully lightning won’t strike twice!” she says, laughing.